My name is Betty and these are just photos of me in my Skeleton Halloween costume/makeup. It's definitely not perfect - but I definitely had fun with it :) ! I originally wanted to be "Corpse Bride''- I even bought a super long blue wig (from Sammydress.com) online! Except after trying on the wig I realized it would probably be annoying to wear it out the whole night since it was so heavy . Since I bought the white lace backless dress already, I still wanted to be a bride! 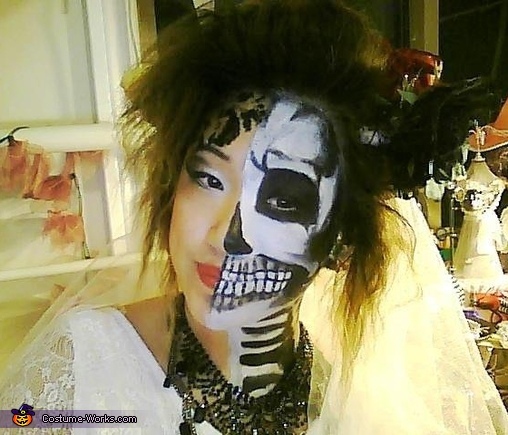 I wanted to go for something "spooky'' yet still "pretty," so I thought why not do half skeleton/half normal bride! > cut a long piece of the tulle and wrapped it around/glue gunned it to a headband. - there was a normal diamond looking one, except I was going for more of a "dark/glamorous" type of bride! I hope you guys like it :) ! Definitely the best costume! The makeup, the jewellery, the hair everything was done beautifully! This is one of the best Halloween costumes I have seen!